In the Gulf of California, magma rises from Earth’s interior along a zigzagging zipper of spreading centers connected by major faults. 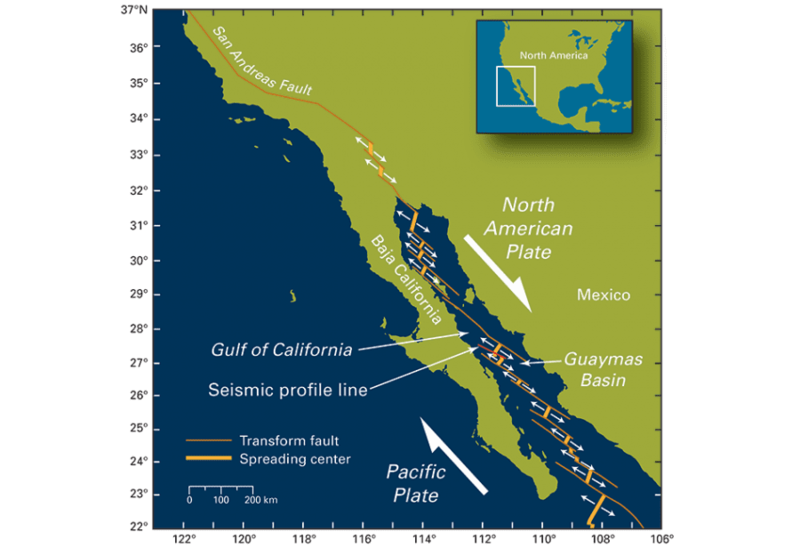 The magma solidifies, adding new ocean crust to the seafloor, widening the ocean basin, and further separating the Baja Peninsula from the rest of Mexico. 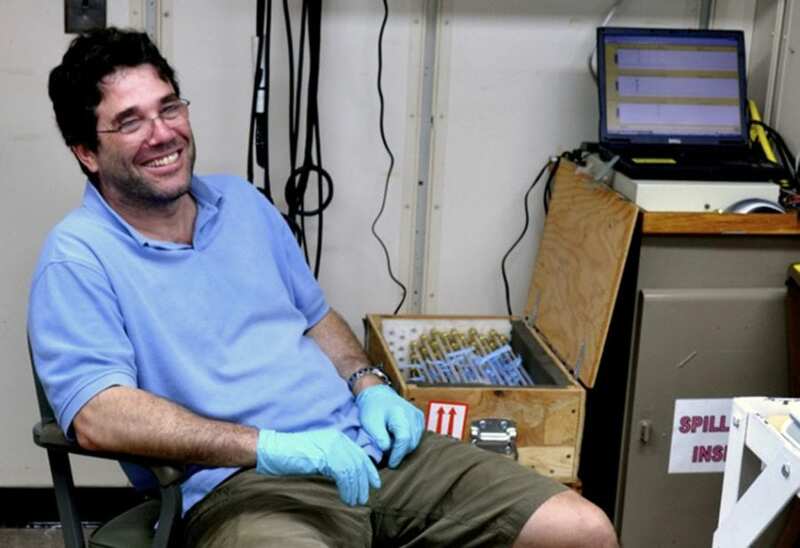 Lizarralde, a geophysicist at Woods Hole Oceanographic Institution (WHOI), obtained a seismic profile across the western portion of the basin—a sonar slice down through the sediment to about 2 kilometers (1.25 miles) beneath the seafloor—that offered a glimpse of the ocean crust’s structure and composition. 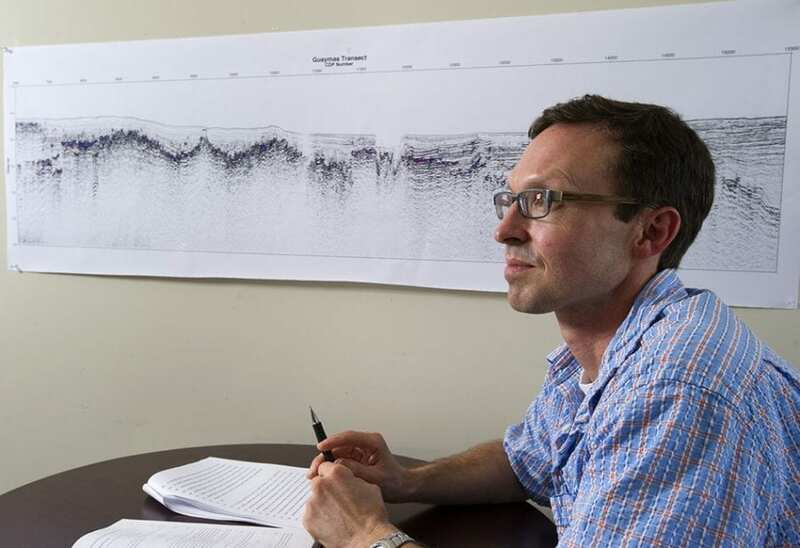 He taped the seismic profile to his office wall, where it hung for a long time before he realized that some of its characteristics were more than unusual. According to the conventional wisdom of how seafloor crust forms, they were impossible. This graben was heavily cloaked in about 600 meters (1,968.5 feet) of sediment. That didn’t surprise Lizarralde. Sediment accumulates fast in the Guaymas Basin because a lot of material blows and washes in from the margins of the nearby land. Large blooms of plankton in the Gulf add even more material to the seafloor. Also as expected, the Guaymas sediments were thinner near the spreading center and thicker farther away. Magma rises to the seafloor at the spreading center and flows laterally from there, so ocean crust farther away from the center is older and has had more sediment accumulate on top of it. But one spot on the profile caught Lizarralde’s eye. It was a tall, thin feature about 28 kilometers (17 miles)—or about a million years—away from the spreading center, but it was covered by only 100,000 years’ worth of sediment. That feature was not the only oddity on the profile. Much of the structure beneath the seafloor didn’t make sense. Instead of smooth layers of sediment stacked on each other, the layers were disrupted, jumbled—“ratty-looking,” Lizarralde called them. 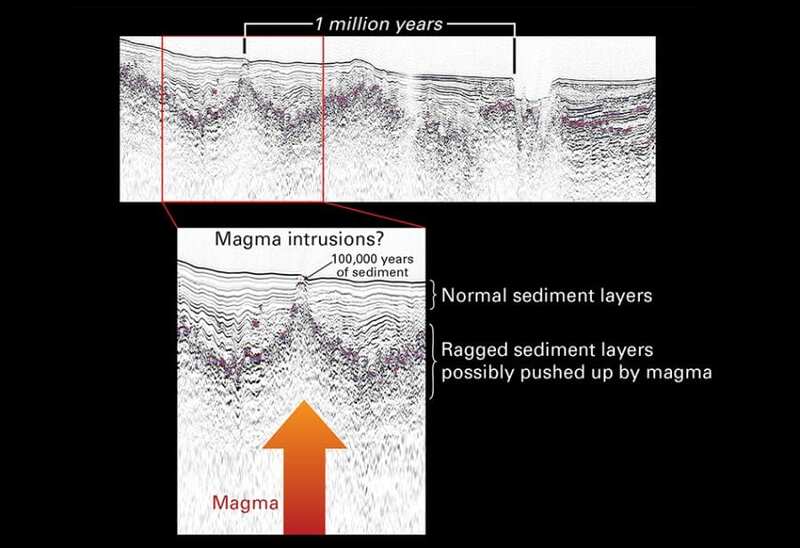 It looked as though magma had pushed up into the sediments, disturbing the orderly layers. Normally, magma gets “focused” at the spreading center, so it emerges within 5 kilometers (3.1 miles) of the plate boundary rather than across a more expansive area. 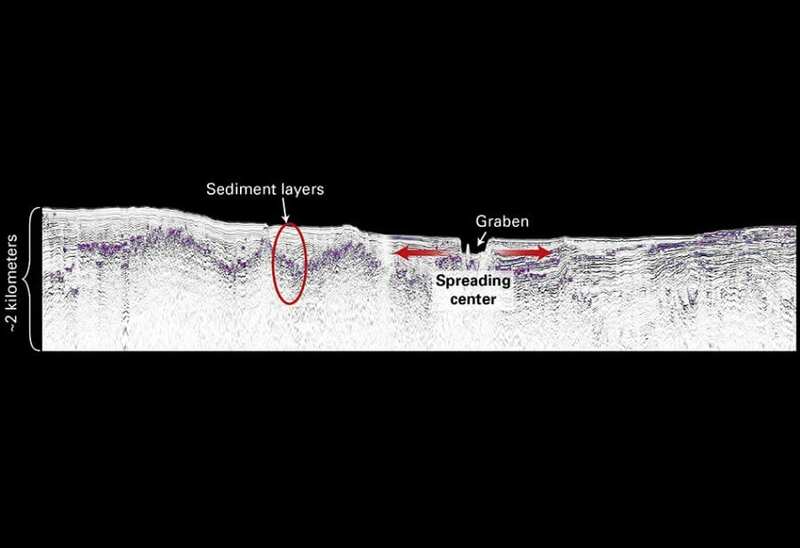 Some of it intrudes into the sediments right near the graben. But in the Guaymas Basin profile, magma appeared to have penetrated sediments in many locations up to 50 kilometers (31 miles) away from the plate boundary. For some reason it hadn’t focused. He quickly realized there was a relatively easy way to find out if magma was, in fact, intruding into outlying sediments. 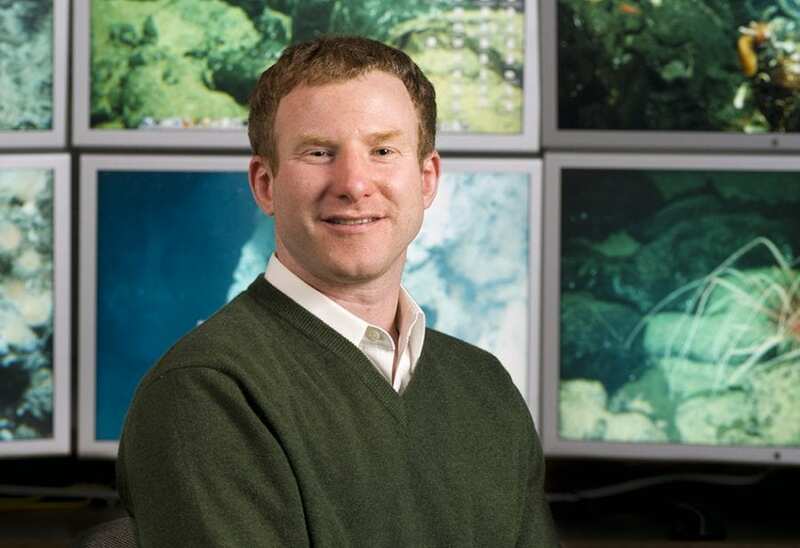 Just as ore prospectors use the presence of certain plants to indicate deposits of valuable minerals, he would use the presence of seafloor organisms that feed on methane to prove the underlying geology. His rationale was simple. 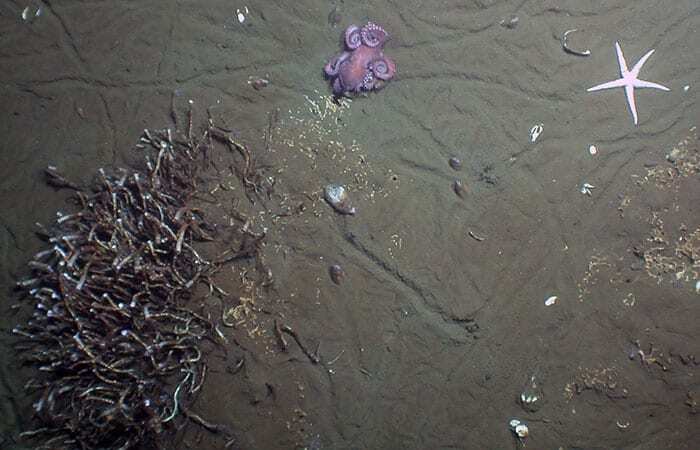 As those hydrocarbons percolated through the seafloor, they would provide nourishment for microbes, which in turn would attract a host of predatory and scavenging organisms. “So if this is happening, we ought to see a bunch of seafloor life away from the spreading center,” he said. That was very much contrary to generally held ideas that the deep ocean floor is mostly barren of life, aside from oases where circumstances provide nourishment for organisms. 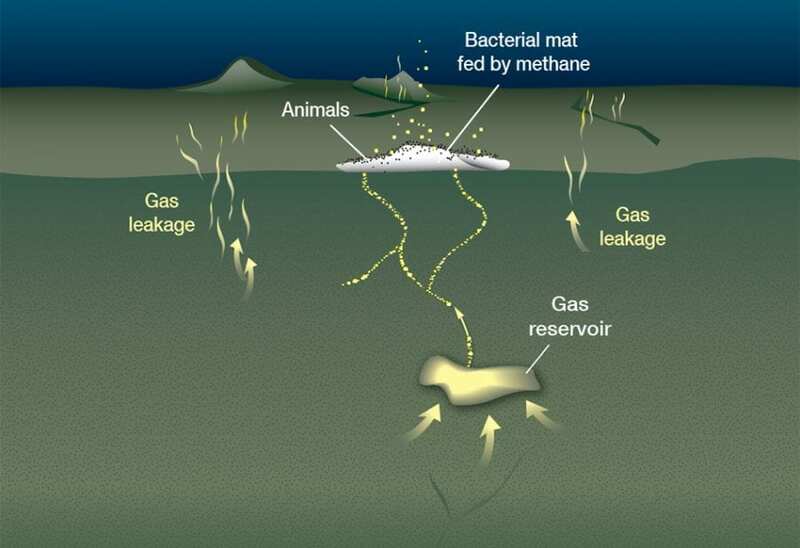 At cold seeps, for example, the sheer weight of sediments drives methane and other nutrients out of buried reservoirs into the water. In hydrothermal vent systems at spreading centers, volcanism drives hot, buoyant, chemical-rich fluids to form geysers at the seafloor. 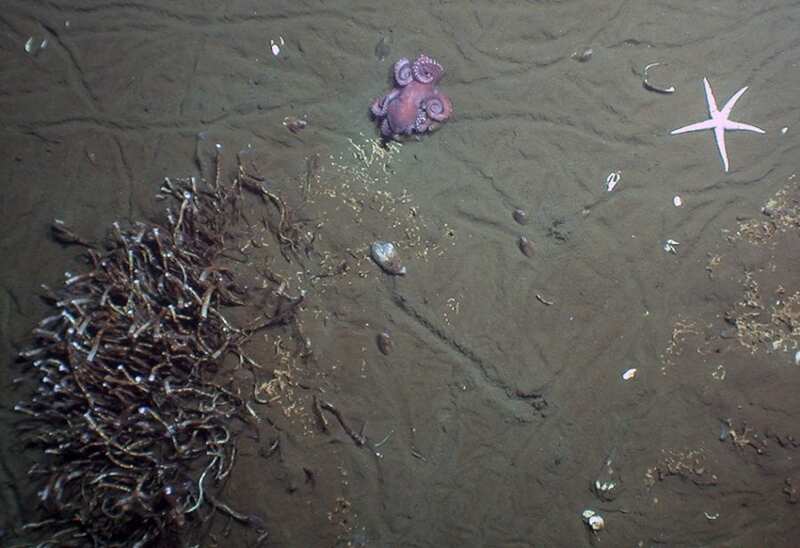 Scientists had studied hydrothermal vents in the Guaymas Basin in detail, but no one had bothered to do more than a cursory survey of the Guaymas seafloor beyond the spreading center. Though the plan to locate seafloor vent sites was conceptually simple, Lizarralde didn’t have experience designing or leading the complex field operations required for a seafloor mapping program. Needing a partner, he went down the hall to pitch the idea to his friend Adam Soule (above), a volcanologist who had the technical and scientific expertise to lead such an expedition. 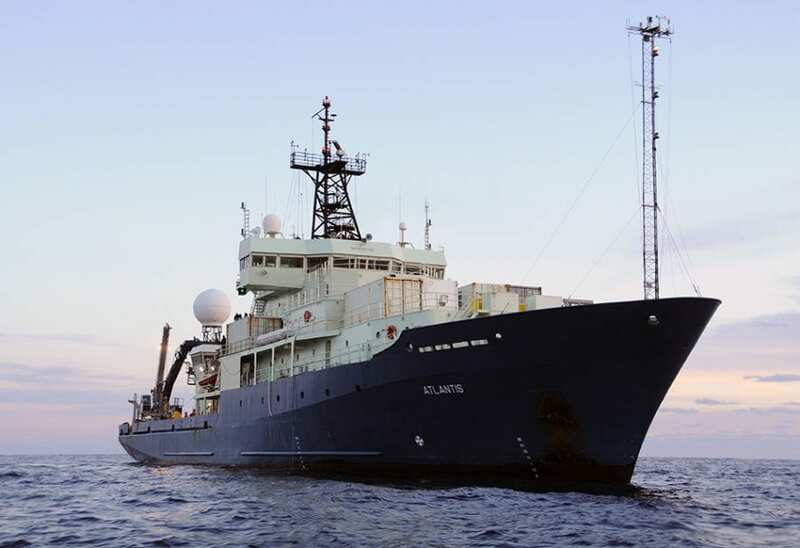 Soule agreed to serve as chief scientist, and in October 2009, he and Lizarralde sailed to the Guaymas Basin aboard the research vessel Atlantis to map the floor of the basin and look for evidence that magma had come up into the sediments far from the spreading center. 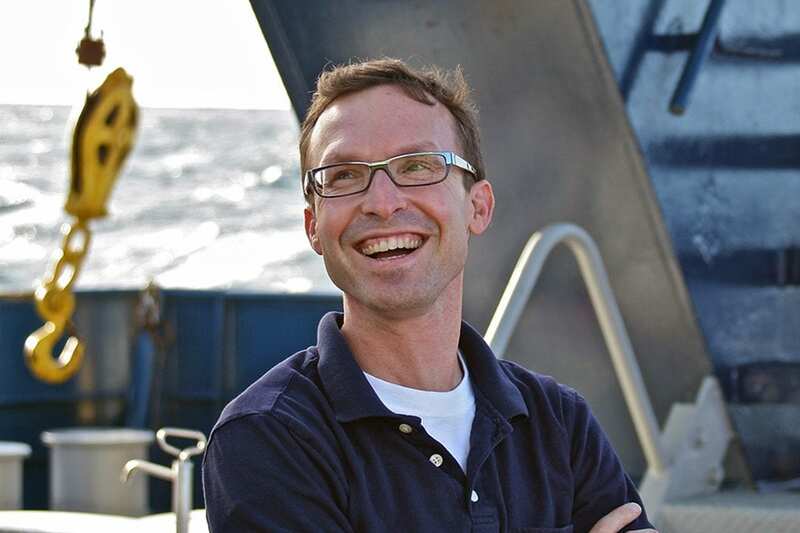 Joining them were WHOI colleagues Dan Fornari, a marine geologist who has developed several deep-sea imaging systems, and postdoctoral researcher Giora Proskurowski, a geochemist. 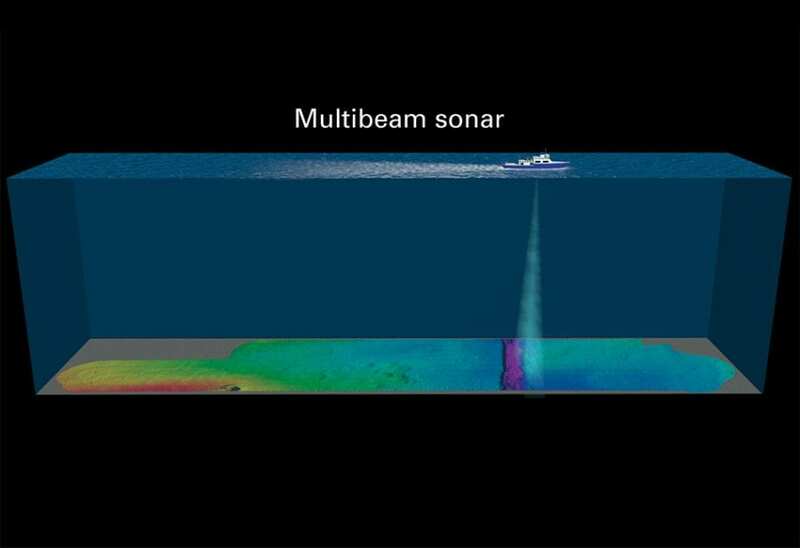 The researchers first tacked back and forth across the basin as a multibeam sonar mounted on the bottom of the ship emitted sound waves that reflected off the seafloor. That gave them an overall view of the bottom topography. The study area was about 55.5 miles (90 kilometers) by 12.4 miles (20 kilometers) and included the part of the seafloor lying above the seismic profile that started it all. Then it was time to get a closer look at the texture and physical character of the seafloor with a different form of sound imaging. 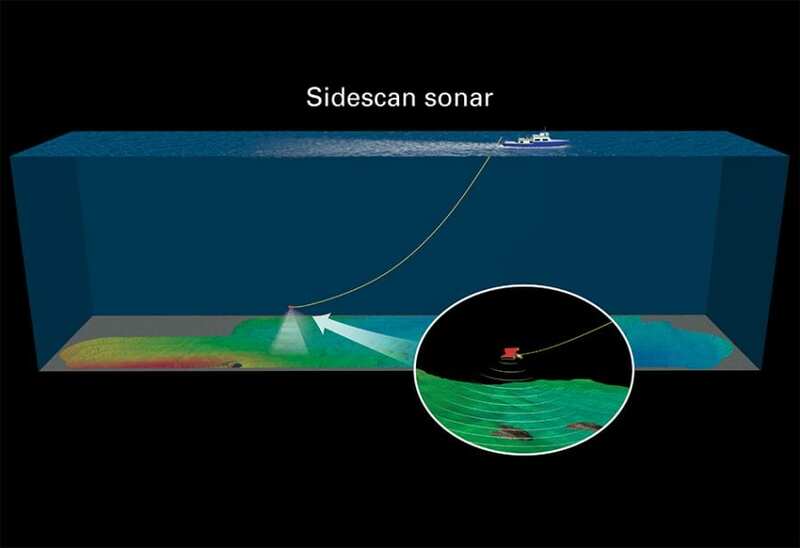 “I thought the best approach would be to use sidescan sonar, which is like taking an aerial photograph of the seafloor, but instead of using light, you use sound to ‘light up’ the seafloor,” said Soule. 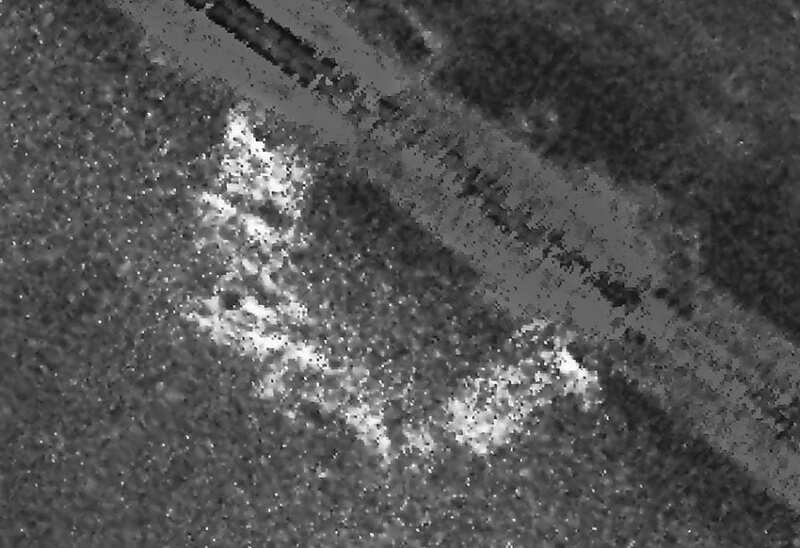 They towed the sidescan sonar back and forth across the study area, keeping it at a height of about 500 meters (1,640 feet) above the bottom. As with the multibeam sonar, it emitted sound waves that reflected back to receivers on the device. 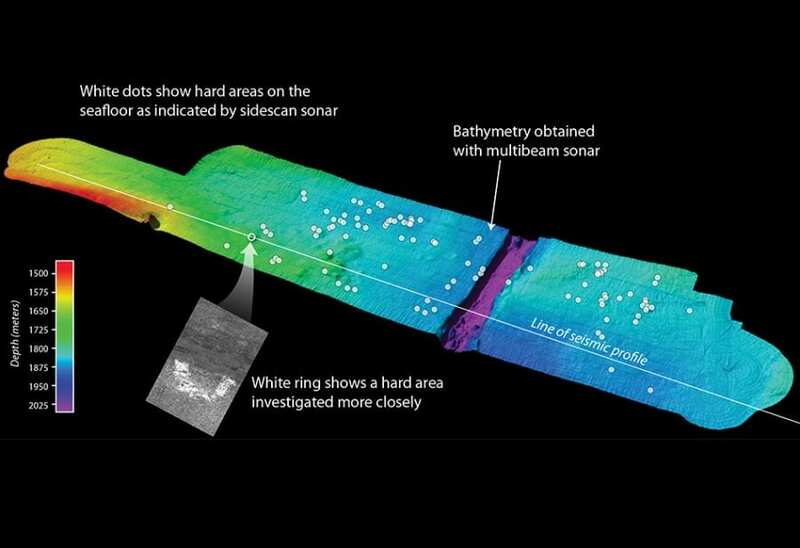 With sidescan sonar, the amplitude of the return waves reveals differences in the density, hardness, and roughness of the surfaces they bounced off. The amplitudes, mapped to the seafloor, produce an image like an aerial photograph. Soft mud yields a nondescript gray image. Hard features such as crusts of calcium carbonate or clusters of shelled creatures produce brighter, lighter-colored images. Images were transmitted up a cable towed by the ship, where the scientists kept their eyes glued to a screen—and their fingers crossed. “There was a real possibility that we’d go out there and see nothing—just mud,” said Soule. But within hours it became apparent that the team was in luck. Against the dull gray background of seafloor sediment were dozens of bright reflective features. “These things stuck out like Christmas tree lights,” said Soule. The sidescan images revealed about 100 of the reflective spots, most about 200 meters (219 yards) across and about 10 meters (11 yards) high. That was encouraging, but the most crucial test still lay ahead: Would there be a bright spot over the subsurface feature that Lizarralde had noticed in the seismic profile, that he thought had been created by intrusion of magma? The screen showed a bright halo about 750 meters (820 yards) across—bigger than most vent sites at the graben of fast-spreading centers. And it lay on the seafloor directly above the curious feature that first caught Lizarralde’s attention on the seismic profile. After scanning the whole study area, the team went back to ten of the reflective spots to gather chemical and temperature data. 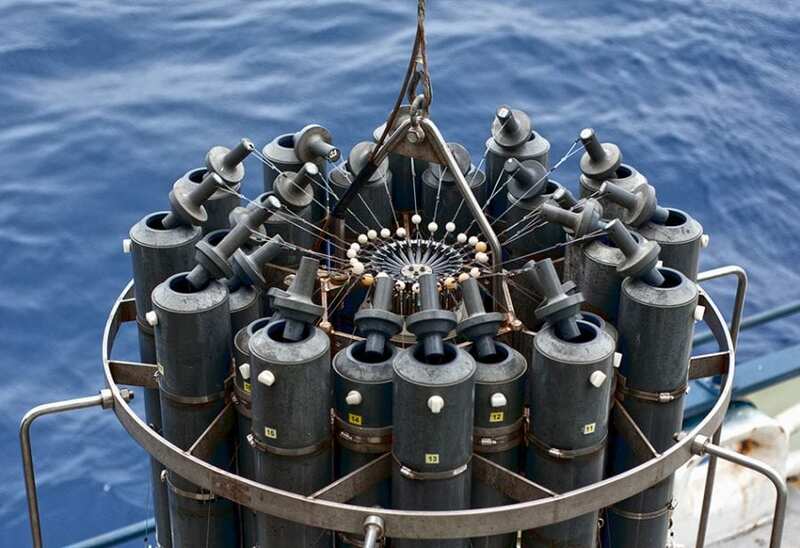 Proskurowski used Niskin bottles to collect water samples from just above many of the features and brought them back for analysis in the lab of WHOI geochemist Jeff Seewald. At every site they tested, they found abundant methane and helium-3, and less carbon-13 than usual, all of which indicated that material was coming out of the sediments as a result of heating. They also found that water near the patches was significantly warmer than in areas farther away. The bull’s-eye was the warmest spot of all. So far, sonar, chemical analyses, and temperature readings all supported the possibility that magma had intruded into the sediments far away from the spreading center. But the discovery of lush seafloor life really nailed it. The researchers had planned to look for signs of life at the bright spots using an underwater camera attached to a high-speed fiber-optic cable. But when that system needed a time-consuming repair, they decided to try a new device that had recently been developed by WHOI engineer Marshall Swartz (above). Known as the SDSL Data-Link (Synchronous Digital Subscriber Line), Swartz’s device married an Ethernet link to an ordinary sea cable normally used to transmit electrical signals. The result was an inexpensive, sturdy system that could transmit images and data in real time. It had only been used once before, but the team had little choice. The team towed the device toward the big bull’s-eye and watched the screen that displayed what the camera was seeing. Since the seafloor was about 2 kilometers (1.24 miles) down, for more than an hour they saw only darkness or the monotonous grey muck of bare seafloor. But finally, there it was, right on target: an enormous patch of clams, crusty mats made of bacteria, and tubeworms. Over its 48-hour deployment, the SDSL Data-Link sent about 15,000 images up the cable. 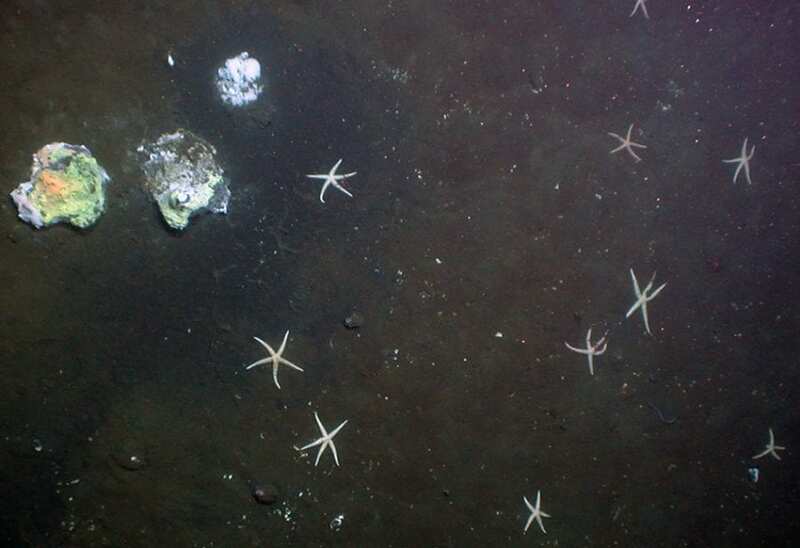 At most of the sites they examined with it, the researchers saw thriving biological communities—proof that nutrients were flowing up from the seafloor at those spots. 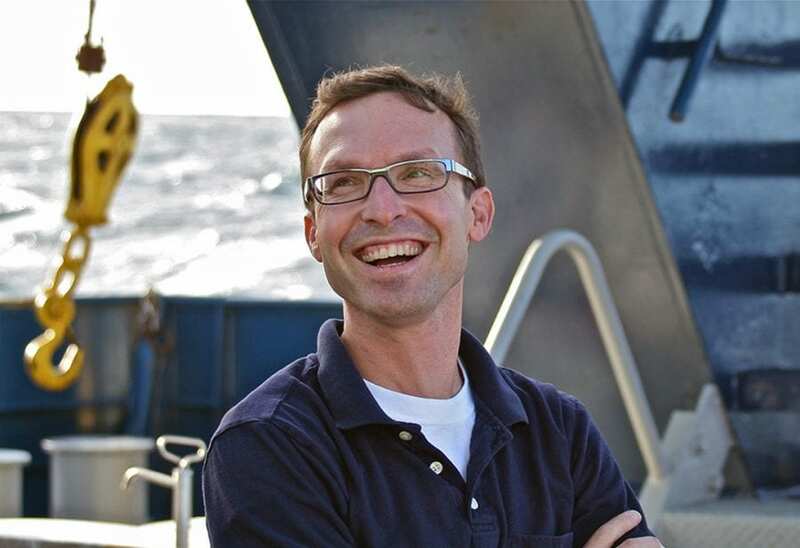 The sites represent a previously unknown scenario where seafloor communities can thrive, said microbiologist Andreas Teske of the University of North Carolina-Chapel Hill. The oases of living things confirmed Lizarralde’s hunch that magma was pushing up toward the seafloor far from the spreading center. But why does that happen in the Guaymas Basin? Does it occur elsewhere? And what does it reveal about how new ocean crust is formed? Lizarralde said the conventional wisdom, that magma gets focused deep below the seafloor and emerges only at or near a spreading center, was based on the fact that there are very few observations of magma below a spreading center not being focused. But the mechanism—how melt gets focused—has never been adequately explained. He thinks the situation in the Guaymas Basin suggests that the key to focusing is the lack of sediment found at most spreading centers. With little sediment to cover and plug up cracks in the igneous crust, frigid seawater circulates through the crust and removes heat in much the same way that a car’s radiator cools a hot engine. This type of advective heat loss is so efficient that magma either freezes in the mantle or stops rising at the bottom of the cold crust and flows laterally along the freezing front toward the hottest spot in the region—the graben at the plate boundary. At Guaymas, the situation is different, he said. The very thick sediment acts like sand in a radiator, preventing cold water from circulating efficiently and from cooling the magma via advection. Instead, cooling takes place via conduction, which is much less efficient. As a result, everything is hotter, and magma isn’t channeled along a freezing front toward the plate boundary, but simply keeps moving straight up—and sometimes breaks through the crust into sediments far from the graben. Lizarralde and Soule said the large number of these so-called “warm seeps” they found is significant. And that’s just in one relatively small ocean basin. The scientists think the same thing could be happening at many sites on the ocean floor. Similar warm seeps seen elsewhere, such as in the Okinawa Trough, had been attributed to a form of volcanic activity, but Lizarralde now suspects they may be like those in the Guaymas Basin. The scientists published their work, which was funded by the National Science Foundation, in the journal Nature Geoscience in November, 2010. But publication didn’t end the story. If the process they observed is more widespread, that raises another question: Just how much carbon is being released into the water? 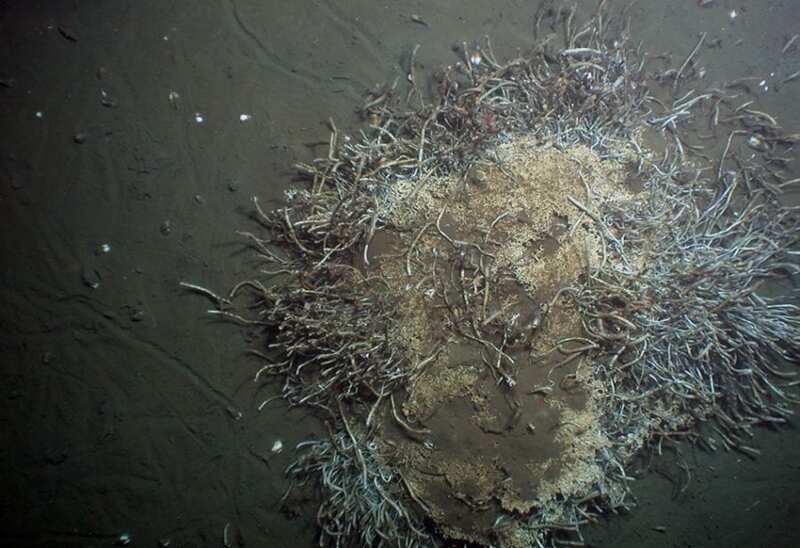 Scientists have thought that once carbon from organic detritus, carbonate shells, and other sources sinks and is deposited on the seafloor, it is sequestered there for a few hundred thousand years. But the researchers estimate that the process seen in the Guaymas Basin could drive as much carbon out of the sediments as goes into them. That means deposits of carbon in seafloor sediments may not be as permanent as previously thought, and we may need to re-think suggestions to use the deep ocean as a repository for excess atmospheric carbon. Lizarralde said seafloor organisms would recapture some of the released carbon, but a substantial amount escaping to the ocean could reduce the pH of seawater and have impacts on marine life. If some carbon made it all the way to the atmosphere in the form of carbon dioxide, a greenhouse gas, it could play an unsuspected role in climate change. Soule, Lizarralde, and Seewald hope to return to the Guaymas Basin with Andy Fisher from the University of California, Santa Cruz, to collect fluid and rock samples at the warm seep patches and further explore the sites’ water temperature, chemical composition, and carbon flow. Meanwhile, the discovery of unexpected patches of life on the seafloor is a source of wonder because of its far-reaching ramifications linking Earth’s interior to its atmosphere.